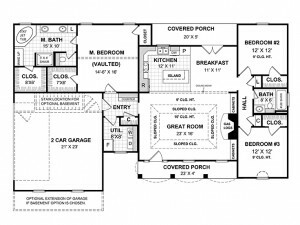 The House Plan Shop Blog » Will My House Plans include Electrical, Plumbing and HVAC Details? Will My House Plans include Electrical, Plumbing and HVAC Details? The home plans published by The House Plan Shop are considered stock plans or pre-drawn blueprints designed to meet the national building codes in place at the time each was created. They do not necessarily meet any state, county or municipal building codes. Furthermore, pre-drawn house plans do not include extensive information regarding HVAC, electrical and plumbing details. Information about the HVAC will be determined locally. The HVAC system will depend on the climate, types of unit(s) you use, and the size of your home/amount of finished living space to be heated and cooled. Necessary ductwork will be determined by the type of heating and cooling system selected and local building codes. Discuss and review all HVAC information with your local HVAC professional or your contractor. While some stock home plans include a simple electrical plan indicating the suggested locations of outlets, switches and fixtures, it will be up to your builder or local electrician to install all electrical elements according to local electrical code. Take time to review the electrical information and details with your builder or electrician before construction begins. Finally, plumbing fixtures are included in stock house plans. However, the blueprints will not reflect a plumbing schematic. The sewer system and flow of water lines are site specific and must be determined by local professionals. Talk with your plumber or contractor to discuss plumbing details.